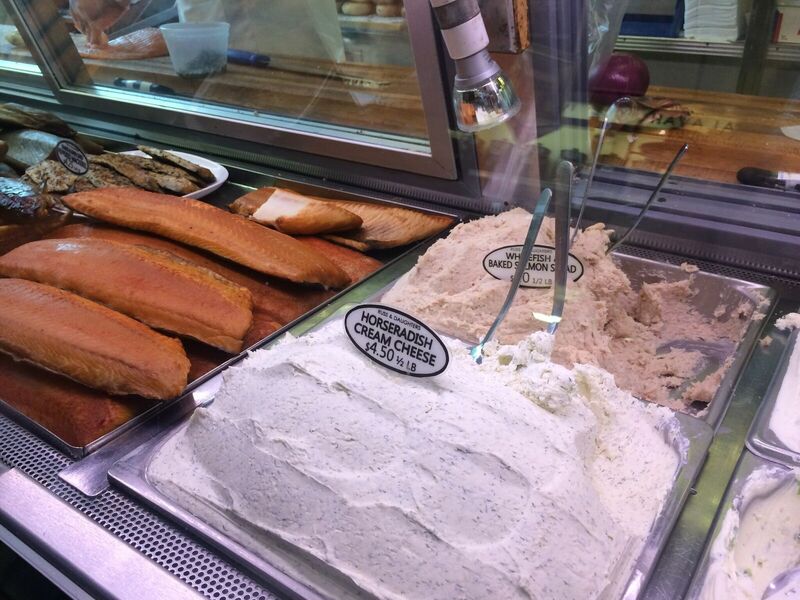 Pastrami, pickles, bagels with cream cheese, smoked lox salmon, pumpernickel and rye breads! 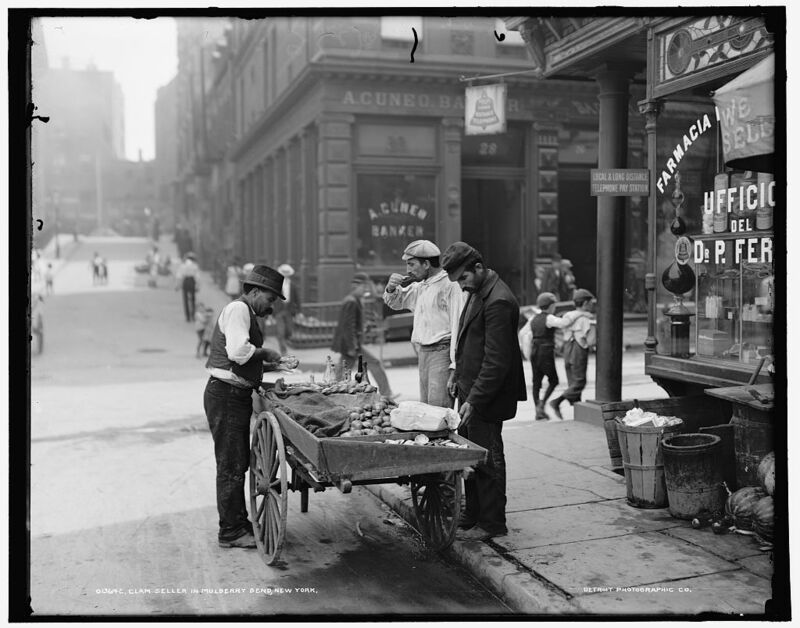 Many of the food we traditionally associate today with New York can be traced to a particular period in time, and a very distinct neighbourhood – the iconic Lower East Side of the late 19th century. This was once one of the mostly densely populated places on the planet, packed with hundreds of thousands of immigrants, living in teeming, overcrowded and often squalid tenements. 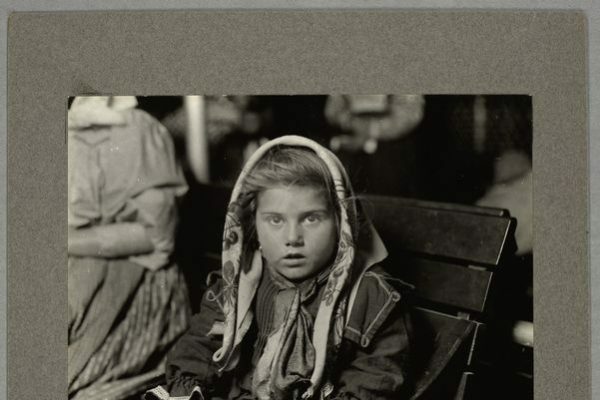 Vast communities of Irish and Germans were followed by Eastern European and Russian Jews, fleeing persecution. 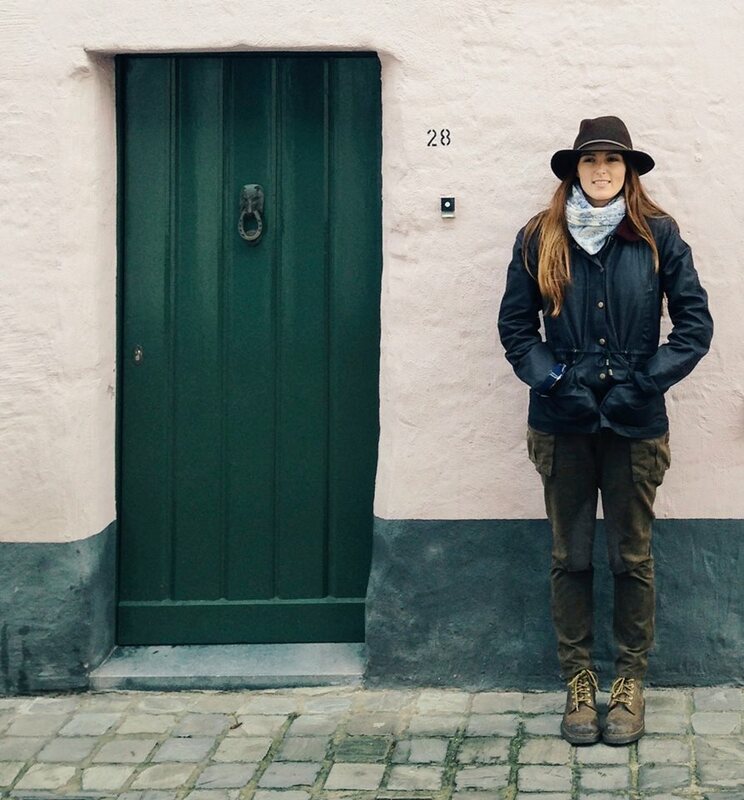 They brought their own distinct culture, language, and especially food. Today, most of the old Lower East Side had disappeared, gentrified out of existence. But dotted around this once iconic neighbourhood, some of the original traces have still survived, in some cases, over a hundred years. 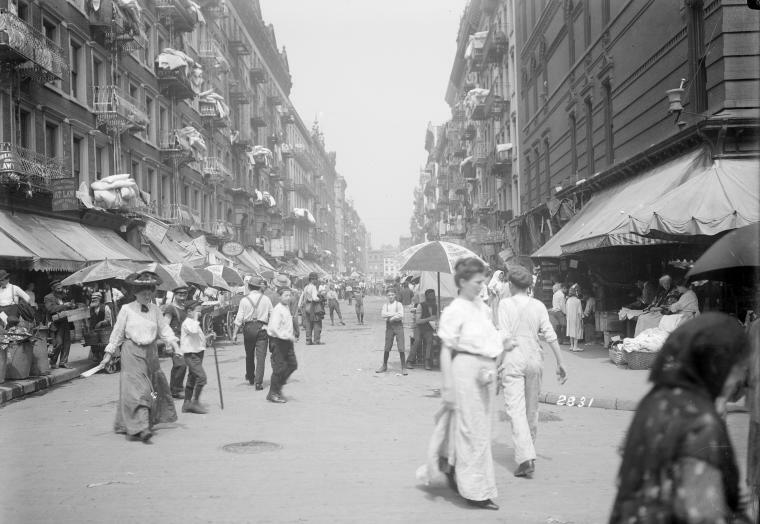 Today, we will be exploring the Lower East Side on foot, searching out the genuine tastes of a part of New York history that once thrived here amongst the tenements. The Lower East Side is located in the south eastern part of Manhattan, loosely bounded by the Bowery and East River on either side, and by East Houston and Canal Streets, running north to south. Situated near the less desirable working waterfront, rents where cheaper here than in the middle of the island. As the never ending convoy of boats disembarked their passengers from Europe, it was natural for these immigrants, some not speaking English, to look for housing in likeminded communities, near synagogues, and fellow countrymen. 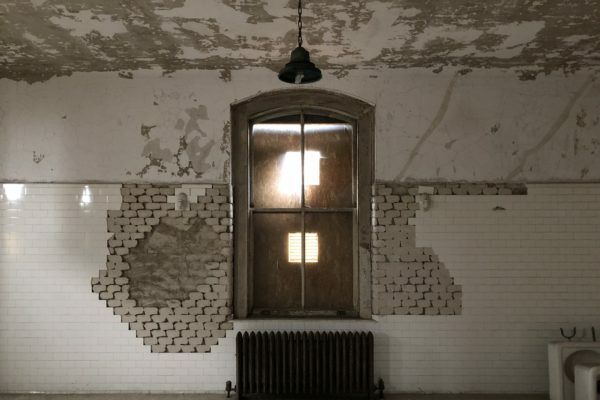 In 1900 alone, an astonishing 1.2 million immigrants landed in New York, passing through Ellis Island. 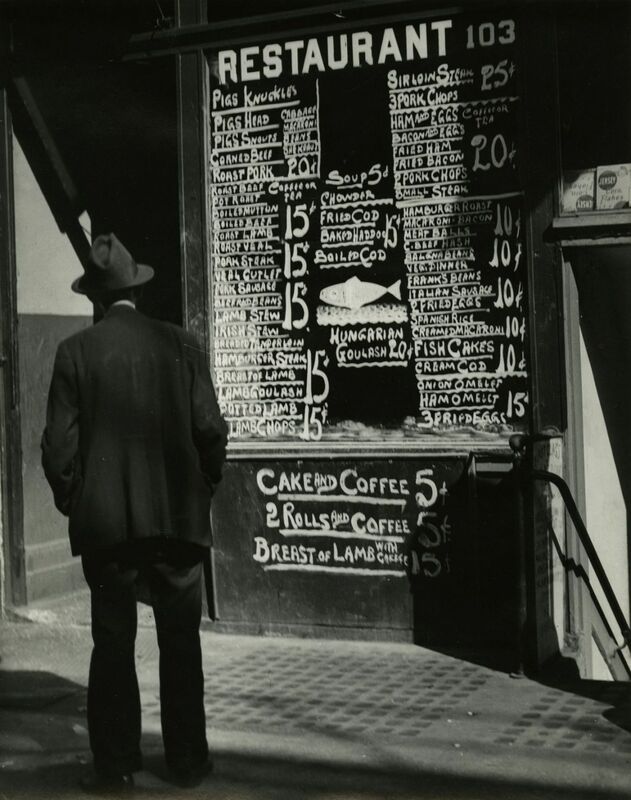 Our first stop, follows one such immigrant, whose tasty treats have been on sale in the Lower East Side for nearly 120 years. 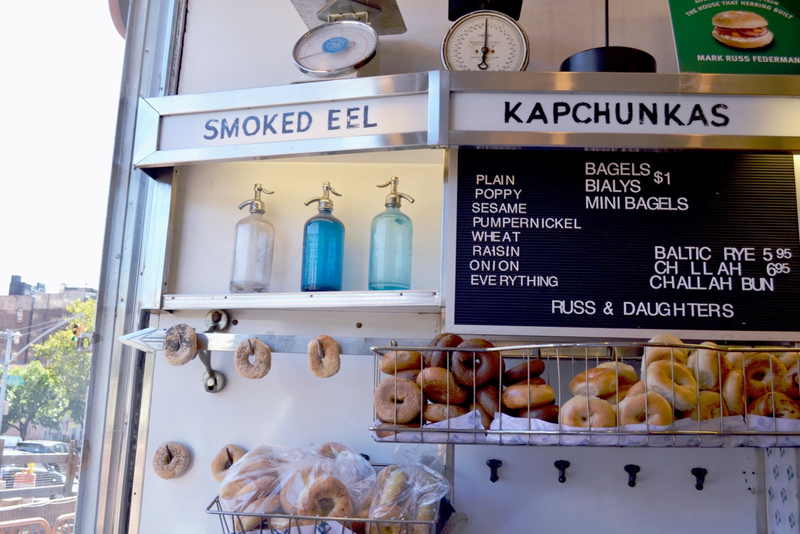 We’re starting our gastronomic guide to the old Lower East Side, at East Houston and Eldridge Street at the oldest knishery in the United States! 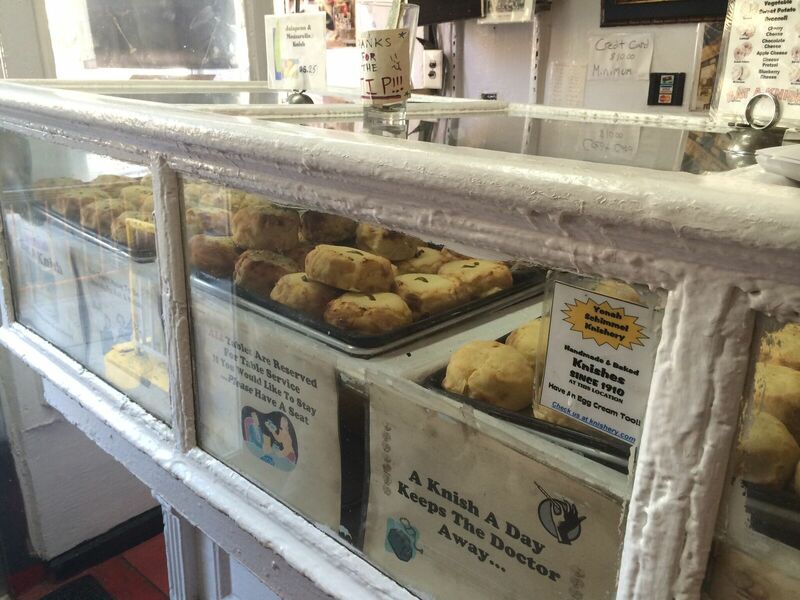 Knishes originated in Eastern Europe. Made of mashed potatoes, cabbage and onions, then covered in dough and baked but never fried, and always round and never square. This staple food, was simple to make, hearty and cheap. 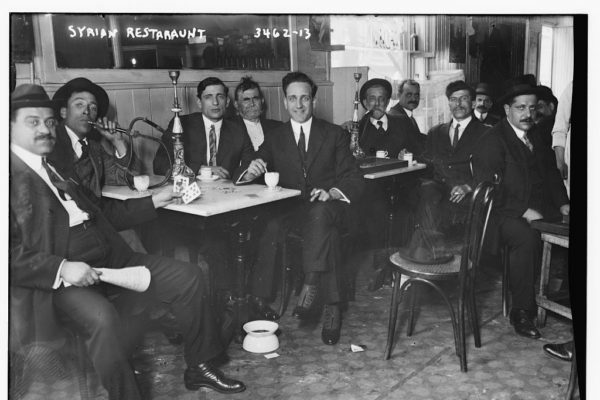 Yonah Schimmel was a Jewish immigrant from Romania, who arrived in New York in 1890. 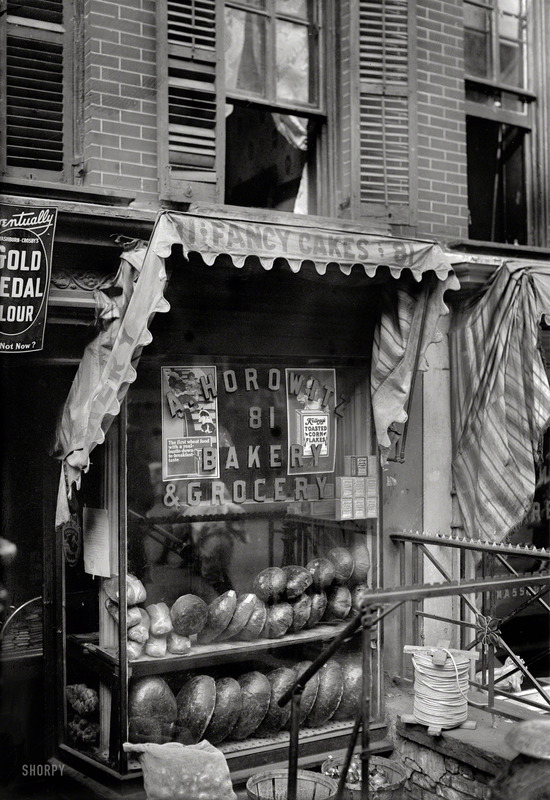 Like many of the food vendors in the Lower East Side, he began by selling his knishes by a hand drawn cart. These push carts packed the narrow streets of the Lower East Side, and sold everything from fruit, pots and pans, carpets, clothing, eye glasses and inexpensive food. 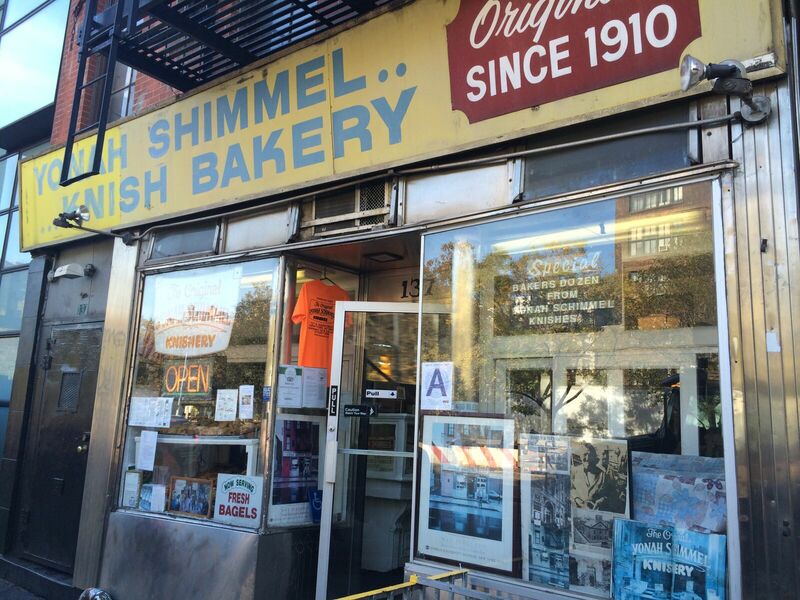 Schimmel’s knishes proved so popular, he was able open a small bakery on East Houston, moving across the street in 1910, where it has remained ever since. 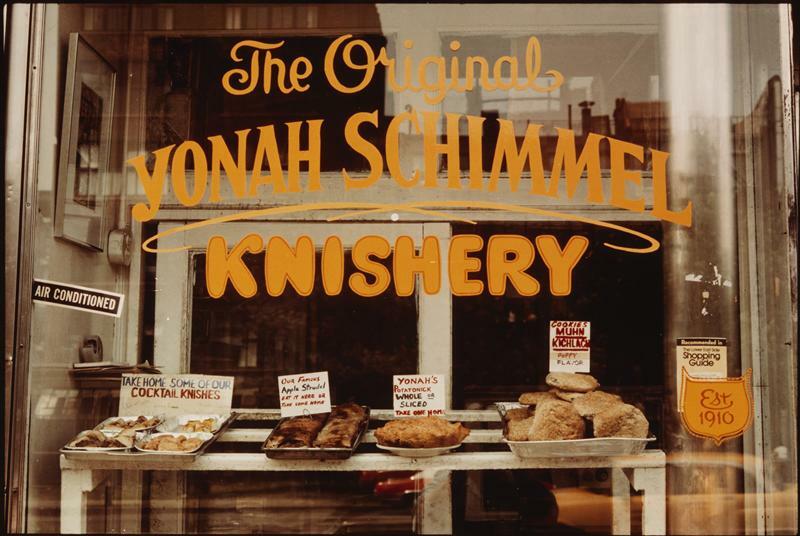 Still family owned, with low tin tiled ceilings, and wooden displays of knishes under glass, walking into Yonah Schimmel’s is like stepping back in time, and is one of the last genuine tastes of a part of New York history that has all but disappeared. 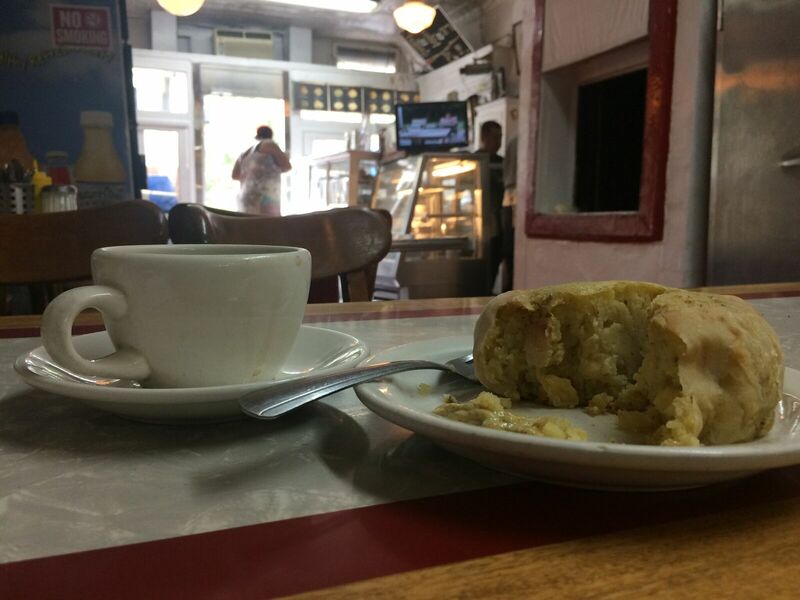 The standard potato knish, heated, and served with mustard and black coffee. 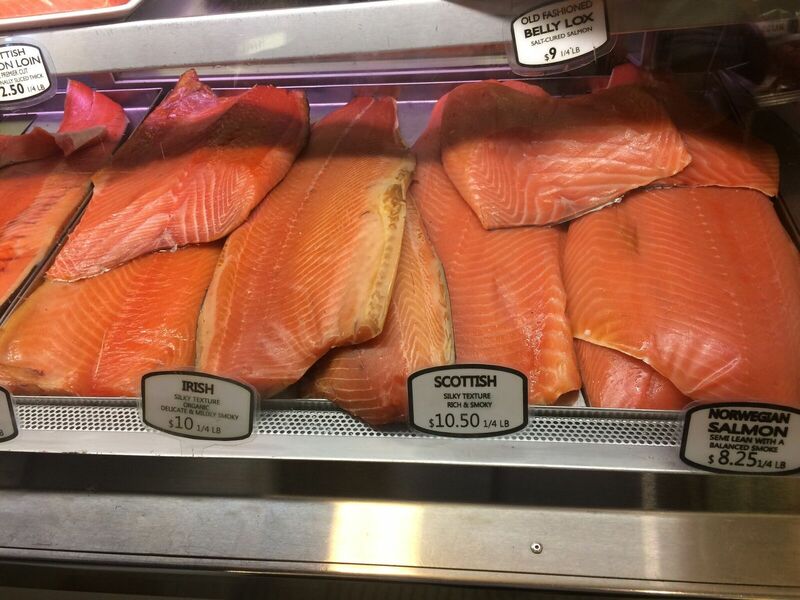 Our next stop is two blocks further east along East Houston, and one of the oldest ‘appetizing stores’ in America, Russ & Daughters. 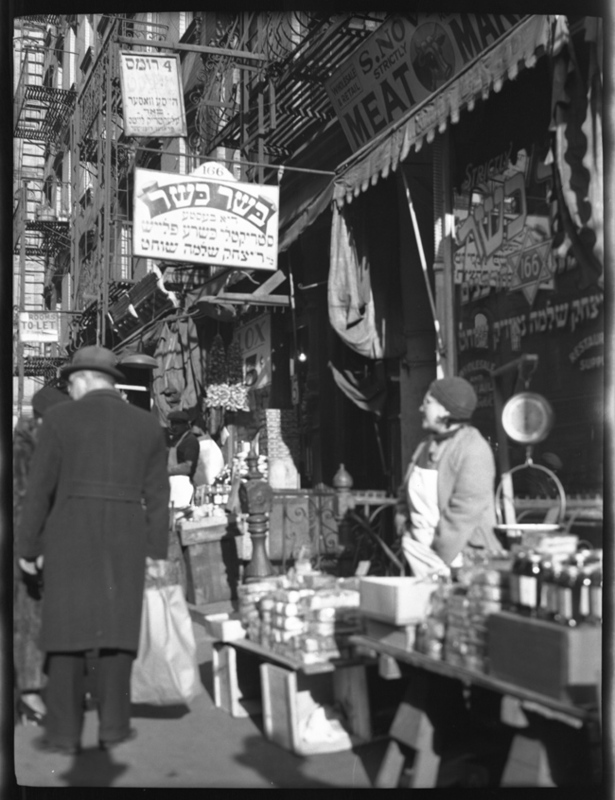 An appetizing store is a Jewish food tradition that sells “foods one eats with bagels.” Jewish dietary laws don’t allow for meat and dairy products to be sold or eaten together. 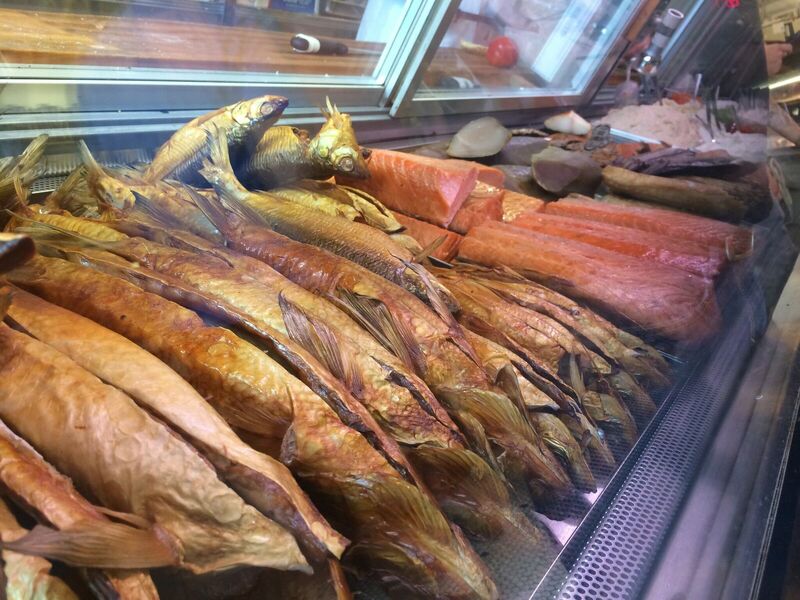 At one point, there were over 30 appetizers packed thriving in the Lower East Side, who sold mainly smoked and cured fish, cream cheeses and salads made from potatoes, fish and chopped liver. 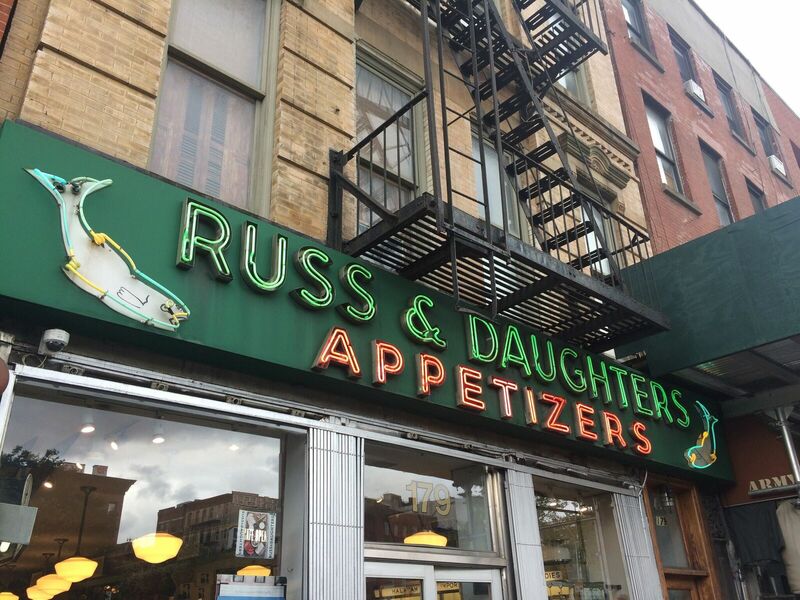 Like Yonah Schimmel, Joel Russ began selling food on the streets of the Lower East Side. First hawking strings of mushrooms on his shoulders, the enterprising immigrant from Poland began selling pickled herrings from a push cart. Proving so popular, he was able to save enough to open a store in 1914. 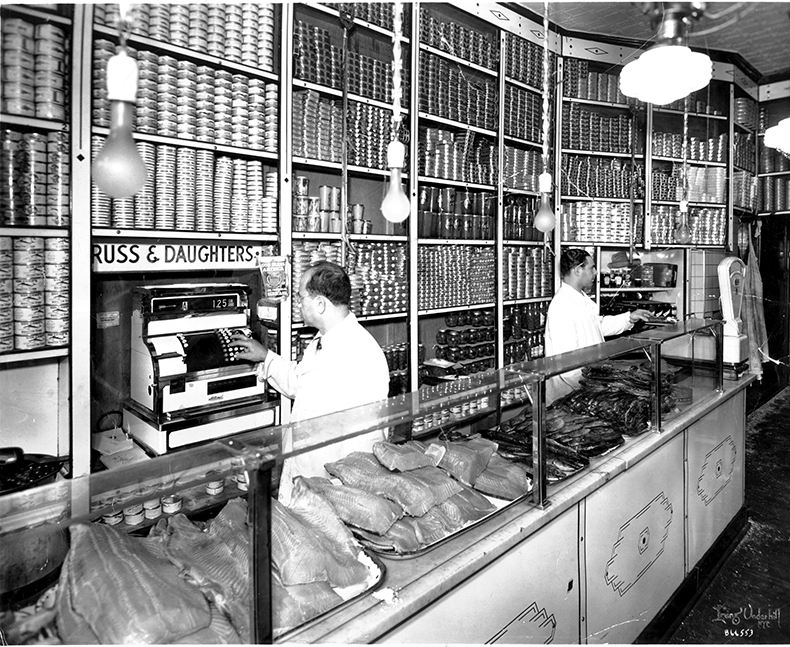 The common practice of most family businesses of the time was to take on the name ‘…and Sons”, but with no sons, Joel Russ made his three daughters partners, and Russ and Daughters is still today, family owned. 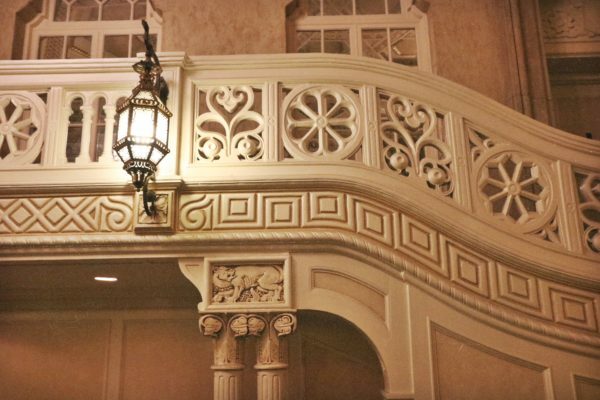 Take a ticket, prepare to wait a little, and order a toasted onion bagel with scallion cream cheese, and the traditional salt-cured belly lox. For our next stop, we turn left down Orchard Street, and into the heart of the old Lower East Side. 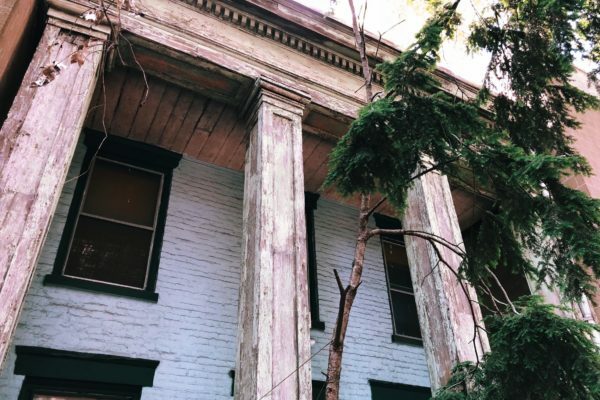 It’s hard to believe today, but this was once all farm land owned by the Delancey and Rutger families around the time of the Revolutionary War, and Orchard Street was named for the fruit orchards that once grew here. 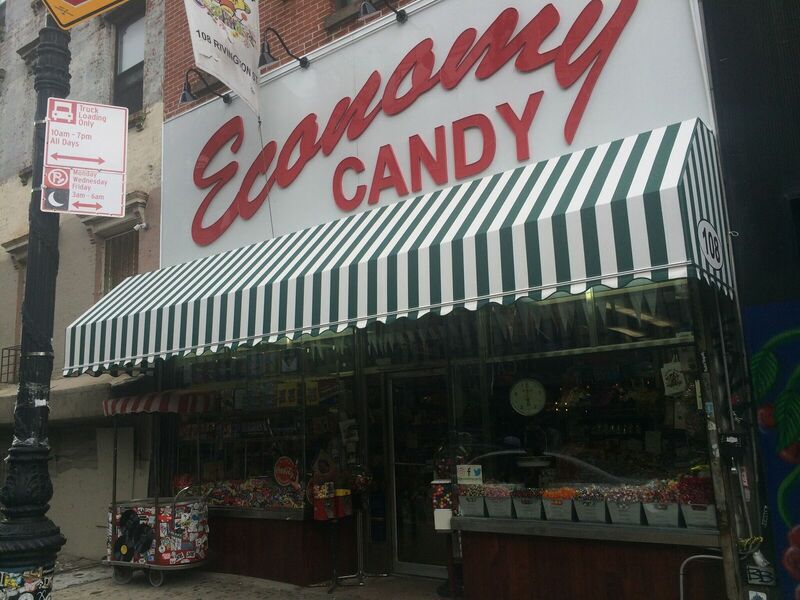 Walking down two blocks and turning left into Rivington Street, it is time to indulge your inner Augustus Gloop with a visit to Economy Candy. 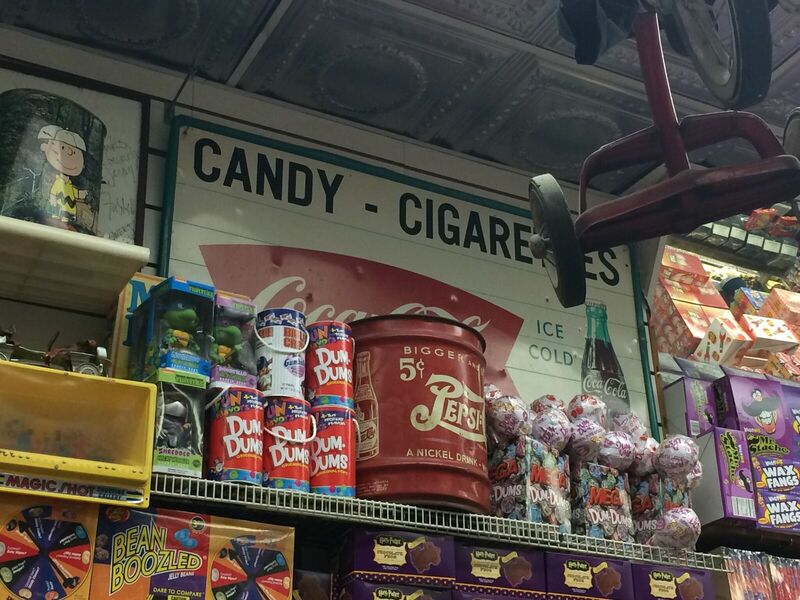 Opened in 1937, Economy Candy is an Aladdin’s Cave, packed to its 20 feet-high pressed tin tiled rafters with sweets and treats. Chocolate covered apricots, halvah, wax lips, five pounds bags of chocolates, long strands of strawberry shoe laces, and everything in between. If there was a sweet you loved in your childhood and thought no longer exists, chances are Economy Candy has it, in a giant bag full. 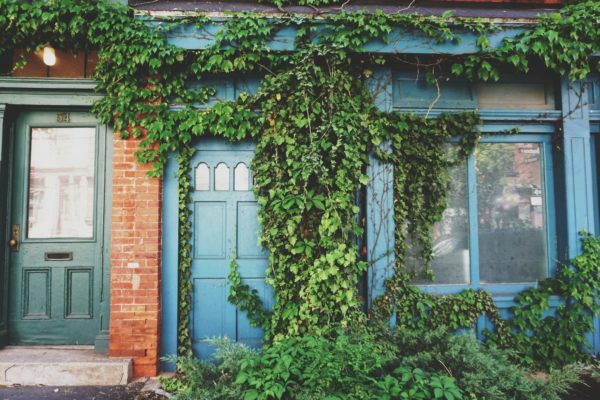 After indulging in the delectable delights of the old Lower East Side, it is a good time to experience another authentic side to the neighbourhood, the infamous tenements. 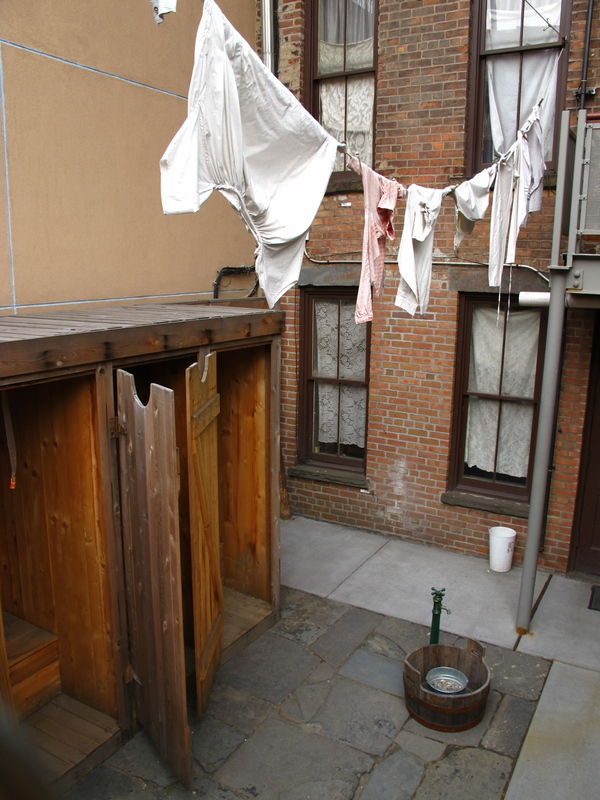 As defined by the New York State Legislature in 1867, a tenement constituted “any building…which is rented…out as the home of more than three families living independently of one another and doing their own cooking upon the premises.” Up to seven people could live in space the size of shoebox. 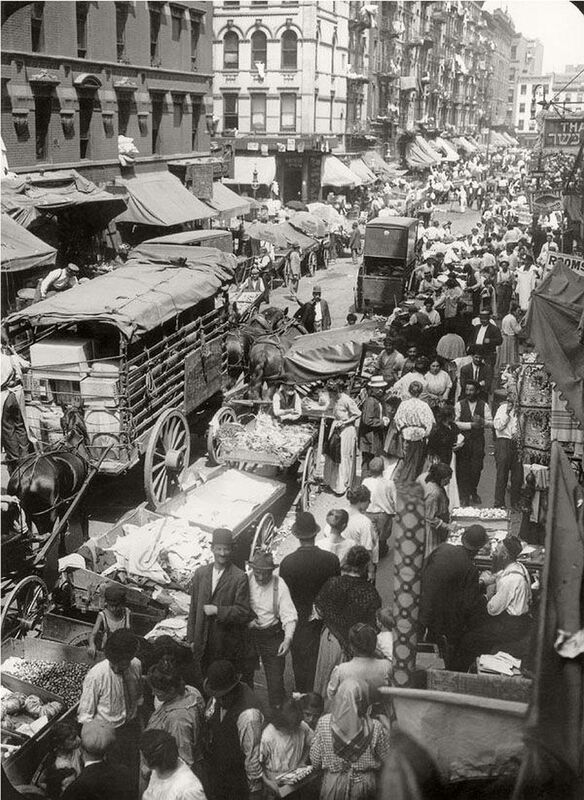 Up to seven people could live within a space of about 30 square meters for a rent of ten dollars a month and at the turn of the century, as New York swelled with immigrants, an estimated 2.3 million people (two-thirds of New York City’s population at the time) were living in tenement housing, mainly on the Lower East Side. Turning back on Rivington Street for Orchard, and walking left one block is the Tenement Museum. 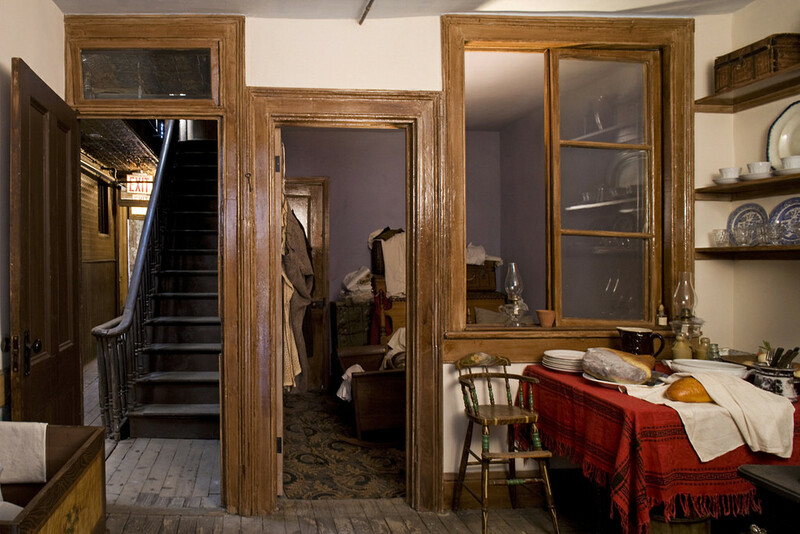 One of New York’s most fascinating museums, the Tenement Museum is situated inside an actual preserved tenement, at number 97, Orchard Street. The tenements derived from the original single family row houses that had been home to the initial wave of German immigrants, back when the Lower East Side was known as Kleindeutschland. But as the German families moved north, the vast swathes of Eastern European immigrants began to overcrowd the same, small neighbourhood. What had once been comfortable single family homes, were subdivided into dense packed tenements. These narrow buildings would have four families on each floor, living in apartments consisting of normally three to four rooms. 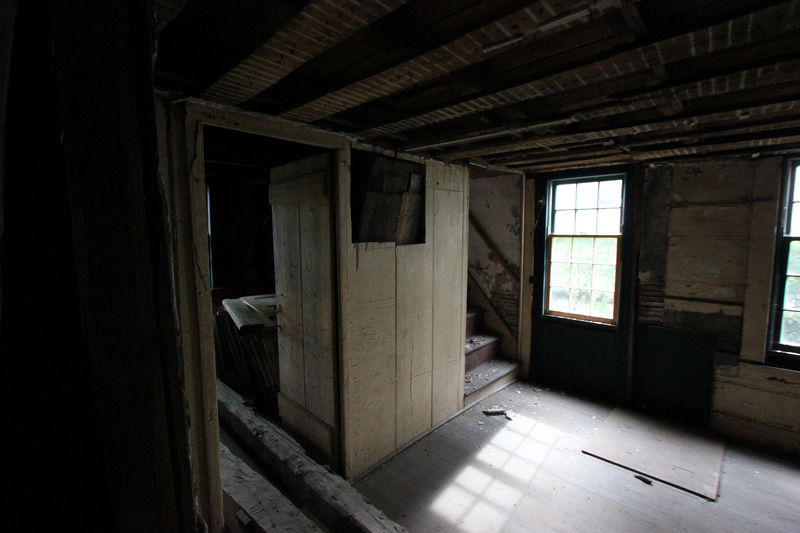 With four or five floors, each tenement could have over 120 people living in often squalid conditions. 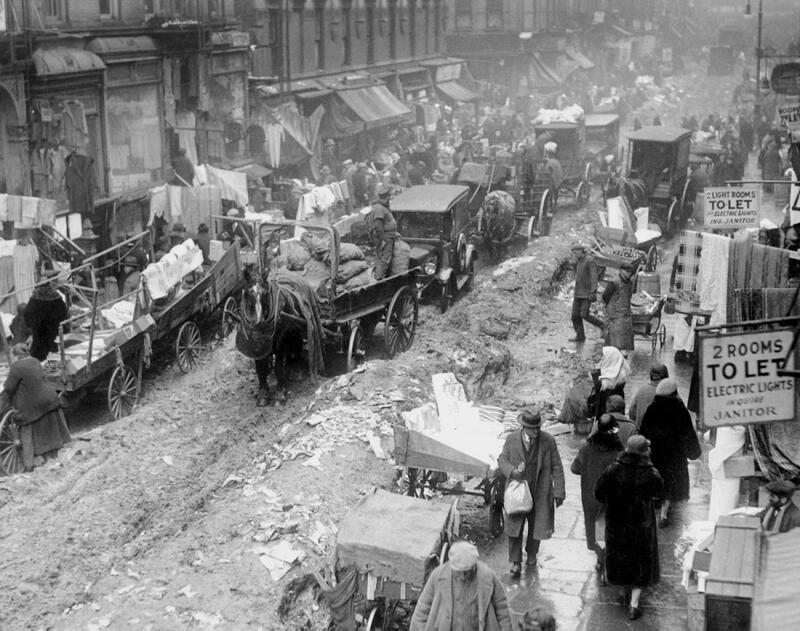 With little by way of sanitation, lighting, fresh air, the teeming tenements of the Lower East Side were still considered an improvement of the fetid slums of the Five Points, and the pogroms and persecution back in Eastern Europe. 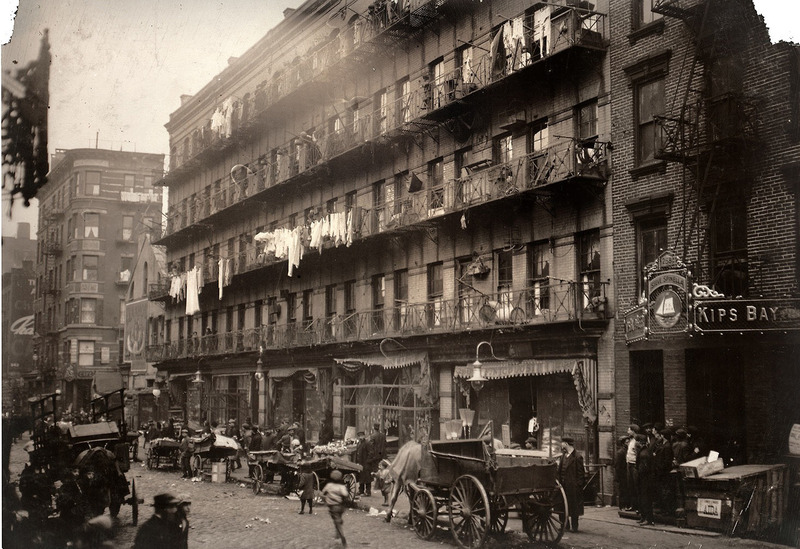 At 97, Orchard Street alone, its thought that over 7,000 immigrants at one point lived here. 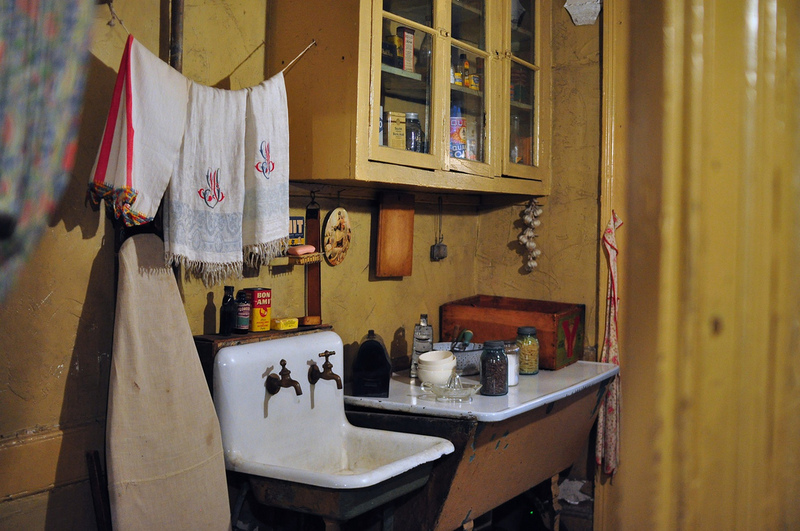 The Tenement Museum runs first rate guided walking tours through the old tenement, telling the stories of some of the people who actually lived and worked here. For the tenement homes were also a place of business. 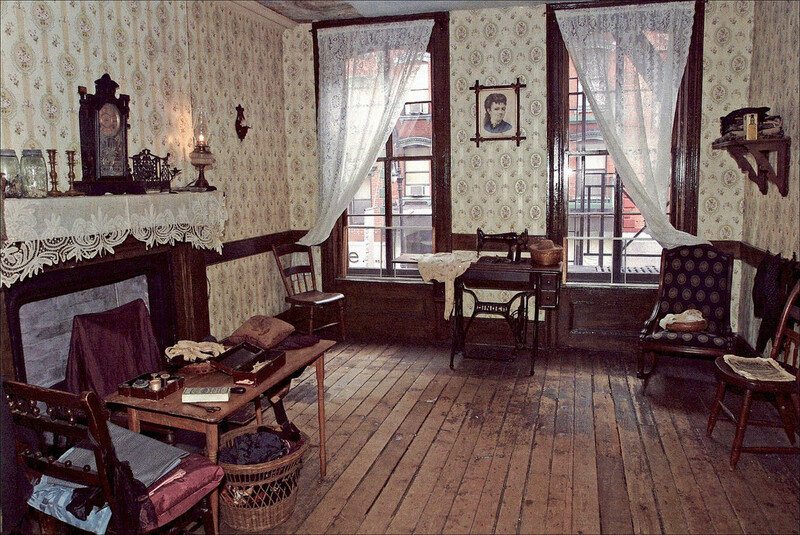 Many of the tenement parlour rooms also served as cottage garment industries, where whole families would stitch, press, sew clothing for sale throughout New York, in cramped, hot conditions that gave rise to the term ‘sweatshop’. By now, your appetite should have returned! 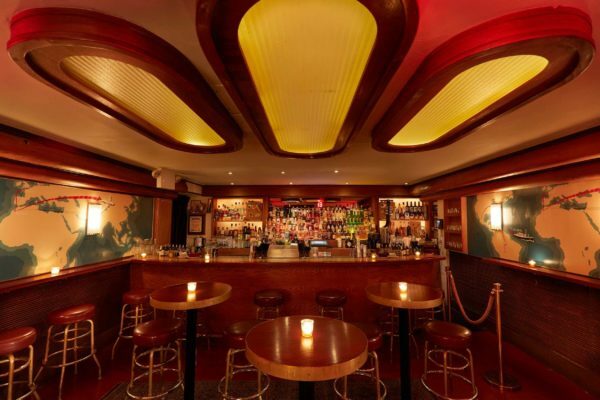 And its time to savour another of the Lower East Side’s most distinctive tastes – the pickle! Continuing south on Orchard Street and turning left onto Grand, you will find The Pickle Guys at the cross section with Essex Street. 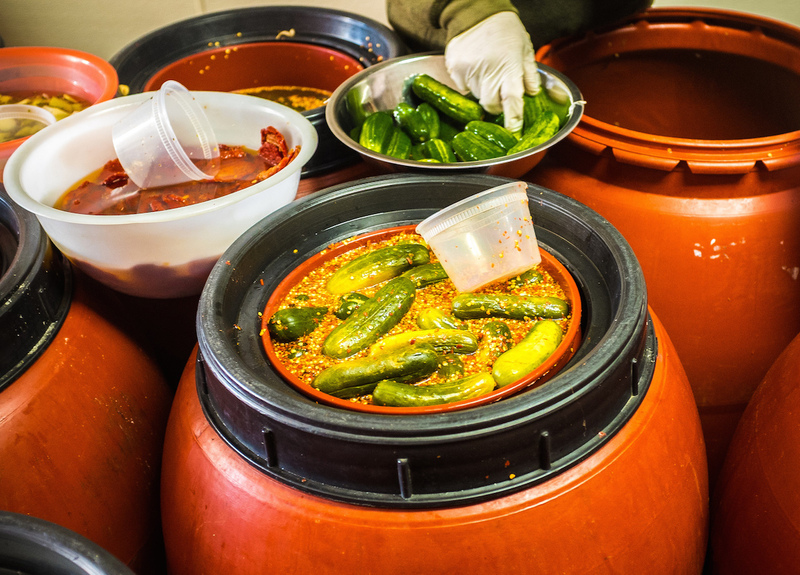 Huge tubs of pickles in all manner of varieties; soured, hot, soaked in horseradish, sweet gherkins, as well as pickled olives, tomatoes and peppers. A quart pot of sours! 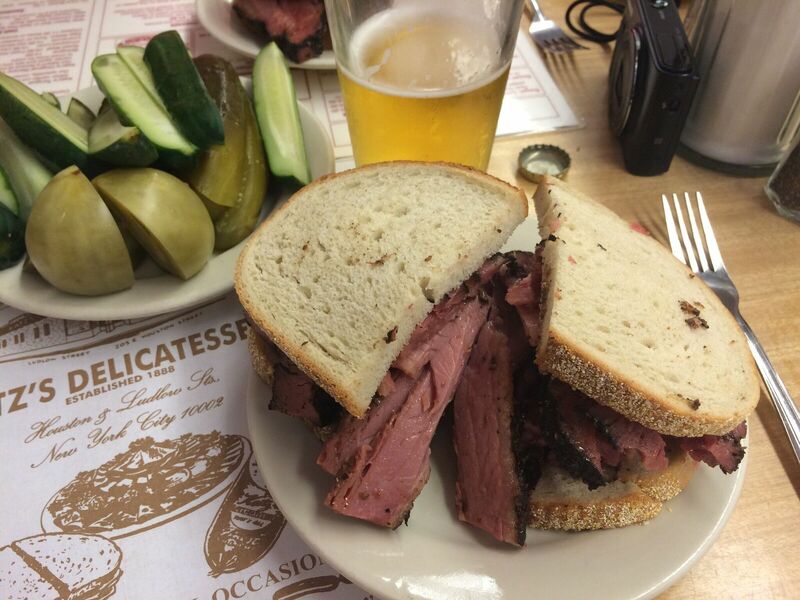 Leaving Grand Street and heading north on Ludlow, we head to our final stop on our tour through the Lower East Side, and one of New York’s most iconic eating establishments; Katz’s Deli. 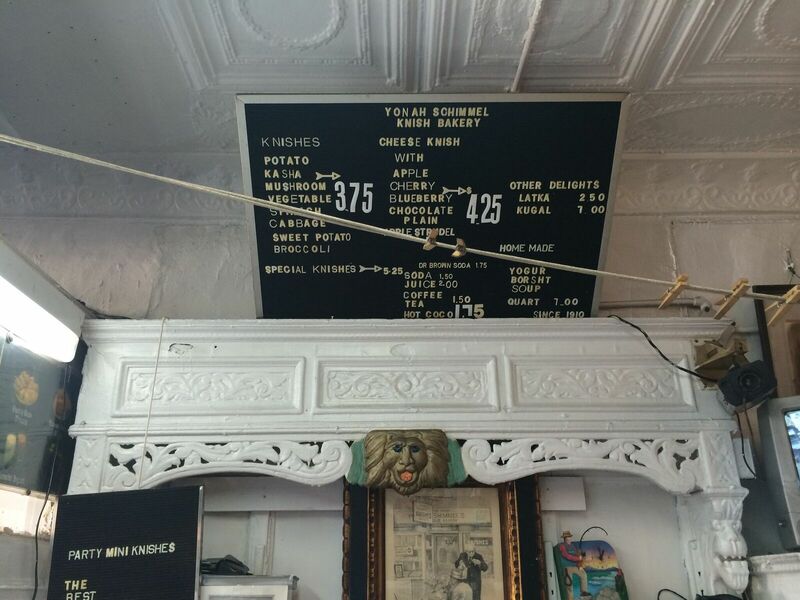 A visit to Katz’s deli is unlike anything else in the city and that starts with the ticket you’re handed when you walk in. Looking like a vintage fairground ticket from the 1930s, the first rule of Katz’s, is don’t lose it. The ticket is your check, that you carry with you from station to station, and which the meat slicers, waiters and cooks will mark down what you had. Losing the ticket carries a $50 fine. One of the true, remaining institutions of the Lower East Side, Katz’s is as authentic as it is delicious. 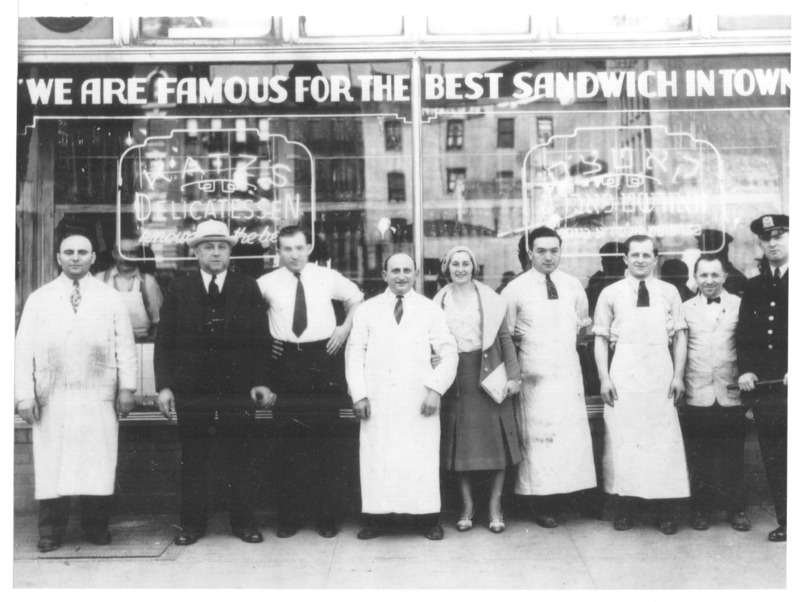 For Jake Dell, who is found every day walking the tables of the vast hall that is Katz’s talking with customers, whether first time tourists, or regulars. That concludes our eating tour of the Lower East Side! 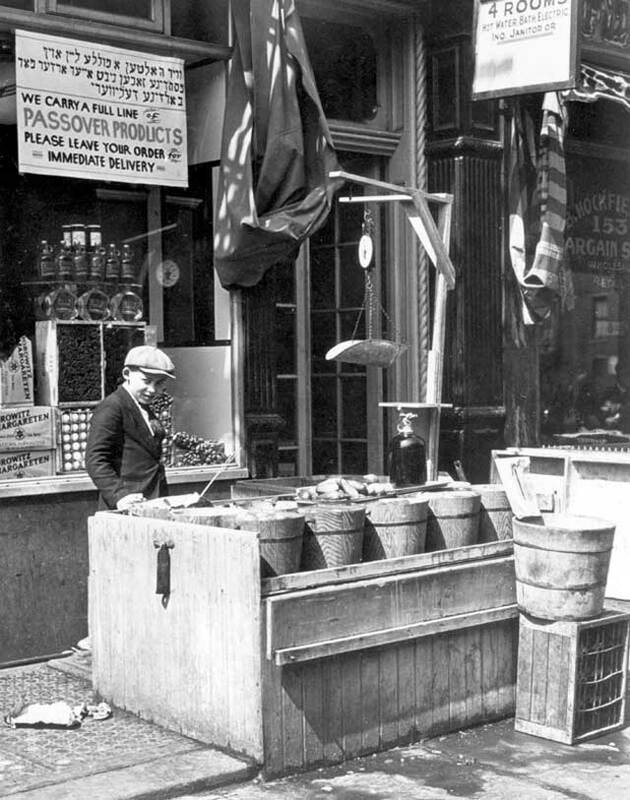 Over two million Jewish immigrants arrived in New York in the late 19th, and early 20th centuries, most of whom lived in this small corner of Manhattan. 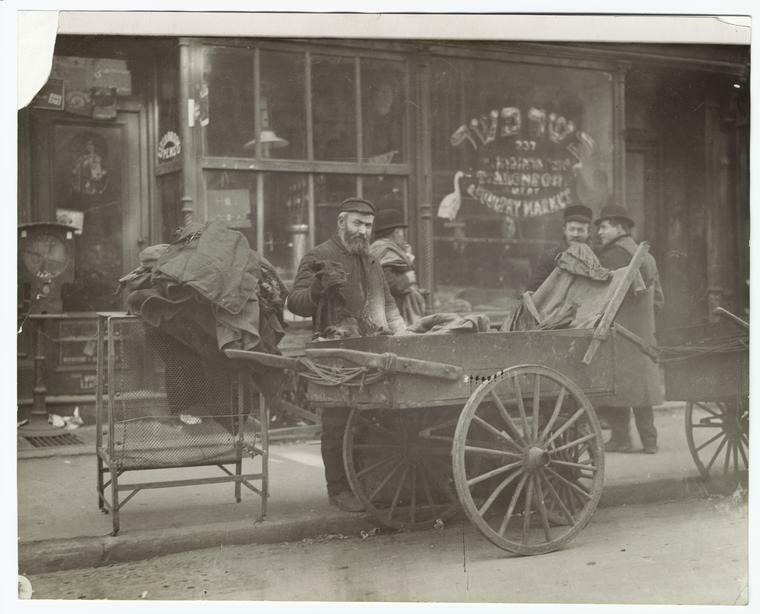 It was a world where Yiddish was spoken more than English, of hundreds of synagogues, street push cart peddlers, sweatshops, theatres and tenements. 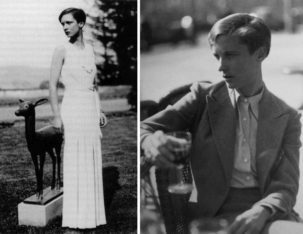 Most of which has all but disappeared, apart from these few surviving tastes of the old Lower East Side. By Luke J Spencer, writer and explorer, editor of Pawn Stars and American Restoration on the History Channel. 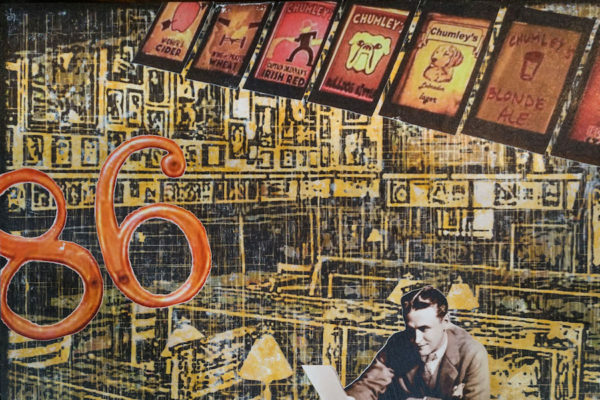 Discoverer of abandoned and unusual places, member of the Society of American Magicians. He also paints on original old love letters from World War II.